Teachers, don't forget those aural and visual learners. The library offers materials in different formats for you to enhance any lesson. Our hundreds of Books on CD range from the picture book Pinkalicious to early chapter books like the Magic Treehouse series. Books on CD are great tools for increasing vocabulary - when the reader says words such as, "Stupendous!" you simply pause the CD and have a quick teach defining and saying your new "Word of the Day." Our THOUSANDS of Youth DVDs provide visual and auditory enhancement for literally hundreds of themes and topics. Are you trying to incorporate other languages into your day but are unsure of how to pronounce them? Check out one of our various youth nonfiction foreign language DVDs and model the process of learning WITH your students! Knowing that music uses both sides of the brain, creative/feeling and analytical, you must check out our children's CD collection to enhance your room's repertoire. 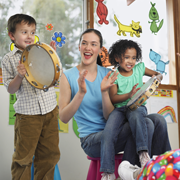 Use our music to help evoke emotion or movement and don't forget to sing along!